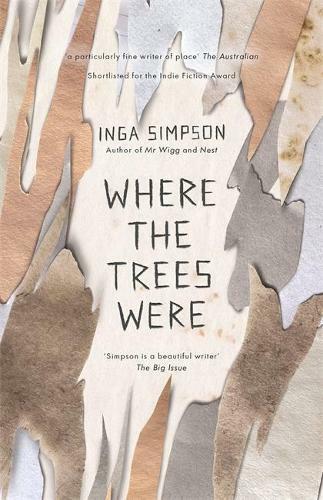 Our head book buyer, Alison, handed me a copy of Inga Simpson’s latest novel, Where the Trees Were, and said, ‘You have to read this, I know you’ll love it.’ How right she was! Alison and I share a love of camping, so she knew I would appreciate the setting for this captivating new novel by the author of Mr Wigg and Nest. Where the Trees Were tells the story of Jay and her idyllic childhood. Growing up on the banks of the Lachlan River, Jay and her four friends spend their summer holidays swimming, drifting down the river on lilos, climbing trees and hanging out at each others’ houses. One day they make a discovery that forges a lifelong bond between them. Running parallel to this narrative is the story of Jay’s adult life, some seventeen years later. Working as a senior conservationist for a gallery in Canberra, Jay seizes the opportunity to put right a wrong from her childhood days. The most notable thing about Simpson’s writing is her ability to transport the reader to the banks of the river and to the streets of Canberra. I felt like I was there in the Lachlan Valley, watching the slow flow of the river, listening to the water lapping at the bank. I could smell the gum trees and hear the rustle of their leaves. Similarly, the images of the country’s capital city were all too real. For such a wonderful novel, the ending of Where the Trees Were was somewhat lacklustre. Even so, I think the journey was well worth it and I can recommend Simpson’s third novel without hesitation.